We’d love your help. 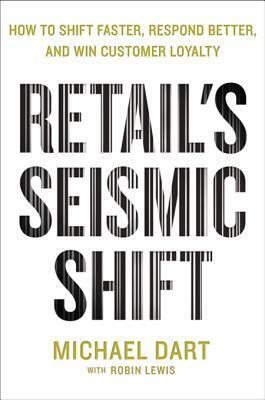 Let us know what’s wrong with this preview of Retail's Seismic Shift by Michael Dart. For one hundred years, retail was designed for the car—buildings and malls to travel to. Now it is designed for the mobile smart device—for consumers to travel with. In a world with an overabundance of material goods, consumer values and the drivers of retail success are being radically redefined. The smartphone has created a world of limitless expectation and logistical p For one hundred years, retail was designed for the car—buildings and malls to travel to. Now it is designed for the mobile smart device—for consumers to travel with. In a world with an overabundance of material goods, consumer values and the drivers of retail success are being radically redefined. The smartphone has created a world of limitless expectation and logistical possibility: What will the retail experience look like in ten, twenty, or even fifty years—and how should all companies be preparing? To ask other readers questions about Retail's Seismic Shift, please sign up. I took a bit of a flyer on this book. I didn't think it would be terribly interesting, but I figured I may learn something new. Was I surprised. The book's subject was fascinating and well presented. Not overly technical (how technical could it be?) and topical. Dart gives a sweeping view of the retail space discussing a variety of topics including behavioral psychology, brand dynamics and demographics to name a few. It's interesting how the retail landscape has evolved over the years and how it I took a bit of a flyer on this book. I didn't think it would be terribly interesting, but I figured I may learn something new. Was I surprised. The book's subject was fascinating and well presented. Not overly technical (how technical could it be?) and topical. Dart gives a sweeping view of the retail space discussing a variety of topics including behavioral psychology, brand dynamics and demographics to name a few. It's interesting how the retail landscape has evolved over the years and how it continues to evolve with the migration to online commerce. He also offers "ideas" from the industry including a few paragraphs from Dave Brandon, the CEO of Toys 'R Us. These were insightful. He offers some prescriptions on how to navigate the future. That part of the book is a bit suspect. It's one thing to survey the past. It's an entirely different thing to predict the future. Overall, it's a good read and something I would recommend. provides much to think about, if at times a little bit over-apocalyptic about it all. Encourages curiosity more than establishes a blueprint. The author(s) never passes up an opportunity to bring up the 2016 election, however, which hurts trust some. super good book on the shift from an economy centered around the car to one centered around the smartphone. Gave updates on buying trends in 2030 from what will be 50% of the consumer population. New insights on retail with many practical leadership examples. Good read!